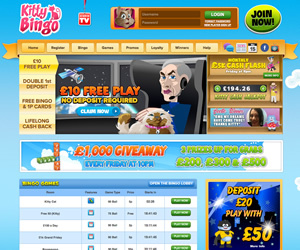 Kitty Bingo is a haven for cat lovers as you can see from the home page that features an array of cartoon cats all promoting the various features of the brand that was only launched in September 2012. The name behind Kitty Bingo is Daub Alderney, the company that bought us Spin And Win Bingo (which closed in October 2012). The home page features details of the jackpots on offer as well as the welcome offers and ongoing bonuses offered from the brand but is it worthy of a "purr-fect" score from online bingo players? Bingo game options are currently limited to just 75 and 90 ball bingo with the 75 games being pattern rather than multi-line of multi-part but in all honesty, this doesn't seem to adversely affect Kitty Bingo. What the brand lacks in bingo game variants it certainly makes up for with the abundance of great slot and casino style games it has to offer. You'll find an array of games and some with pretty impressive progressive jackpots, jackpots you will also find in the bingo rooms. Navigation around the site is easy with a useful menu at the top of the screen that will direct to a variety of different areas from registration to a useful Help area with an informative FAQ section and if you are new to the site, registration takes just a couple of moments and then you are ready to get in on the gaming action the brand has to offer. 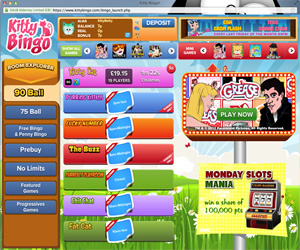 There are plenty of bonuses on offer from Kitty Bingo from the welcome offers to the reload bonuses on all deposits. There's even cashback to be had on all your bingo losses so even if Lady Luck seems to be an infrequent visitor whilst you play, you'll be getting a little something back from this brand. From the main bingo lobby you can see all of the rooms that the site has to offer with details of the game type, numbers of players, time until next games and pot prize. 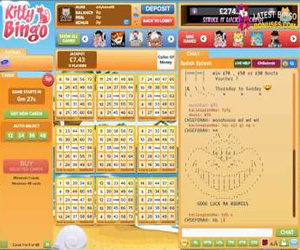 Step into any of the bingo rooms and whilst the site is powered by a completely unique gaming software, it has a very familiar feel to it with a layout that is easy to follow and understand. You'll find your ticket purchasing options to the left of your screen (these become the bingo call board when a game is underway), your bingo tickets to the centre of your screen with prize details above them and then chat off to the right with a selection of mini games above. Kitty Bingo also has a selection of free and bargain games to offer their players alongside a great selection of jackpot games so their is something to suit every budget when you step through their virtual doors. 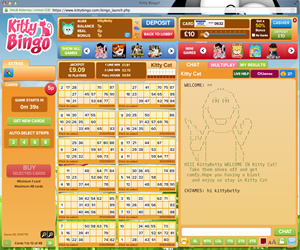 Kitty Bingo currently offers 75 and 90 ball bingo games alongside a selection of instant win games. The minimum deposit required is £5. Please note: A minimum deposit of £10 is required for cash match bonuses. The minimum withdrawal amount is £5. Wagering requirements are slightly different at Kitty Bingo, For the cash match bonuses the wagering requirements are 4x the amount of deposit and bonus received. The same is required for the free spins. Please note: A maximum of £3 for each 20 free spins in winnings from the free spins will be credited to your bonus account.